In the summer of 2002, singer Blaine Braun and bassist Mark Radloff got together for a beer and a barbeque with some friends. They played in a band together in the past, and the conversation ended up revolving around what the both of them were doing musically. Blaine had just finished up with TWIST, a powerhouse modern rock act that had featured former members of platinum selling ECONOLINE CRUSH. TWIST had enjoyed some success in Canada, their debut CD had spawned two video's and garnered them late night talk show appearance's and radio support. Mark had just come off the road of a tour filling in for Vancouver rock act MORNING MAKER, a band that had enjoyed some success and opened for acts such as DEFAULT, NICKLEBACK and DANKO JONES. Unfortunately the tour was cut short by an early morning bus accident, in which Mark ended up being hurt in the crash. The two started discussing the possibility of working together again, and many drinks later the decision was made. This was the beginning of TOURIST. While Mark recuperated, he and Blaine started writing songs and recruiting players. While in the midst of the first demo, Mark starting talking to Greg Whitbeck from MORNING MAKER. The band had recently dissolved and as MORNING MAKER's main songwriter and lead guitarist he was trying to decide what direction to move in. A jam was arranged and the chemistry was incredible. Greg laid down some tracks on the first batch of songs Mark & Blaine had recorded. Without ever having played a live show those first songs from TOURIST had them selected as a 2004 Vancouver's 99.3 CFOX SEEDS winner, joining former winners, NICKLEBACK, DEFAULT and MATTHEW GOOD. With a huge sound, great songs and a stadium class live show, the band was landing gigs opening for bands such as The Offspring, Billy Talent, Thornley, Finger Eleven, Clutch and others. Management was acquired, and as some small tours followed, the discussions with labels and booking agents began. There was a buzz happening. Corporate mergers, label's being bought by bigger label's... whole A&R departments wiped out. After watching two potential record deals disappear, many bands may have called it quits. Instead, the guys played more shows wrote more songs and continued to make new friends. One of the people that took the time to listen was Mike Fraser (AC/DC, SLIPKNOT, SATRIANA, METALLICA, AEROSMITH, HEDLEY). Mike loved the band and the band loved Mike, unfortunately Mike was also busy for months in advance so the band decided to start making the record themselves. After recruiting Mark Henning (TWIST) and the fun begins, we fast forward a couple of months. The band sits down to discuss potential people to mix. Lists are made, beer is consumed and talk centers around Mike. When Blaine and Mike talk... a cancellation has given Mike a free week and he's available to mix the record! More beer is consumed in celebration. Mix begins at the world famous Warehouse in Vancouver, and the band discovers two things... One: Greg is an easy mark when it comes to XBOX NHL HOCKEY and... Two: the record sounds amazing!! Shortly after the recording, the band started looking for a permanent drummer. Blaine's former band mate, Bob Wagner had suddenly become available. Blaine and Bob had talked about doing this from the start, but Bob had previously been committed elsewhere. With Bob's addition, the band had stepped up a level, to where the band's huge sound could truly be appreciated. More live performances follow, and along with a tour for the BUDWEISER TRUE MUSIC series the band continues to work towards building a bigger fan base and developing their live show. "It's been a crazy few years" says Blaine, "Alot of hurry up and wait..." Finally, the wait is over. Tourist' debut "The Relevance Of Motion" available throughout Europe and South America on Sept 29, 2006 on MTM MUSIC / PsychoActive. Available worldwide through ITUNES and CDBABY. "So you play live?...can you write great songs? - Tourist can....this is a band that understands the importance of great songwriting and continue to impress me with every song they record." "Tourist step up to the plate and hit the ball out of the park - these guys know how to Rock!" 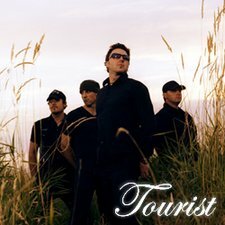 "...Tourist is like a supercharged U2." " I really like this, and it makes me think of great current bands such as Hoobastank and A Perfect Circle. The vocals are great, and work very good dynamically through verse, bridge and chorus. The mix is also very good; the track is heavy on guitars and they are at the front of the mix together with the vocals - still the low end of the bass and drums are present. The hook reminds me of 80's U2 at their best, but I like this band better! review by Simon Lindgren on Garageband"
" ...Tuesday's action on the DKNY concert stage presented a few of our fine local bands - Suspect were good, State of Shock were great but Tourist took control. The band ripped up the stage with solid beats and consummate rock 'n' roll riffs." " Dynamic, emotionally sweeping blend of modern rock and edgy alternative. Sounds like a cross between U2, Our Lady Peace, Fuel, Tool/Chevelle, etc. Lineup is experienced, both as songwriters and on the live circuit and are winners in 2004's The Fox Vancouver SEEDS competition (past winners include Nickelback, Default, Matthew Good), who will include the band on their yearly compilation CD." "...the musicianship and songwriting here is top notch, and shows much potential. I would be interested in finding out more about you guys if I worked a major label desk." "reminds me of a harder U2 or Radiohead at times. This is a good sounding band. The songs seemed to be written with radio accessibility in mind. Good melodies and solid arrangements." "a very interesting hard yet Hot AC/Pop vibe to it. Actually quite unique overall." "Strong performances and song craft all around. This is very pro stuff from a band that seems to have a clear vision and direction. Tons of talent. " "Very well written, performed and produced material here! This band plays with conviction and accuracy, it is obvious that these guys have alot of experience under their belts. Another great Canadian band to watch for!" "A rock track that should remain in the top ten slot for at least a year! New Radio features absolutely incredible musicianship, songwriting and production."